I'm now ready for week 2's challenge in Shauna Hicks challenge for 2014. The subject of internal migration in Australia is one that has always interested me, especially as it highlights the extreme differences between my husband's family and mine. All his ancestors lived in northern New South Wales and the distance I had to cover headstone hunting in the 1980's was only one and a half hours from north to south. They arrived in Australia, made their way to the New England area (some taking longer than others) and settled. This had to do with the purchase of farming land. My family, however tend to be travellers. My headstone search has taken me to NSW, Queensland, Victoria, Tasmania and Western Australia just for direct ancestors. Some of my families moved short distances often, others very long distances. One family story involves my great great grand parents Peter and Elizabeth Ogden. The Ogdens came from Liverpool, England but had lived for several years in Brooklyn, New York. Upon arrival in Brisbane in 1878 where they intended to settle a very pregnant Elizabeth decided it was far too hot and promptly decided they would move further south to Sydney. By 1910 (possibly earlier) they left Sydney and moved to Perth where Peter died in 1911 and Elizabeth in 1927. Sometimes we know the reason why families moved and in this instance I know the reason. One of my great great grandfathers Dr William Lee Dawson and his wife Emma Seabrook lived in Franklin in Tasmania from 1854 until his death in 1871. Emma stayed living in Franklin until the following year when she moved to Melbourne. What prompted this move? I believe it was the fact that several of her brothers and sisters had moved to Melbourne. One of her sons, my great grandfather, William Henry Dawson is next found in Michaelago, NSW working as a police officer. Later he and his family moved to Sydney where he worked as a wardsman at Callan Park. When land became available on the north coast of NSW around Old Bonalbo he moved his family there believing there would be more opportunities for his large family. However, he did not die there. He died in 1916 in Whittlesea, Victoria while visiting his brother. My Allsop family may be the most continuous movers in my family. Samuel Allsop and his wife Elizabeth Handley lived in the Dandenong region of Victoria and are both buried there. Their son, William Henry Allsop and his wife Mary McInerney moved continually throughout their lives. Between 1871 and 1894 their children's births were registered in the following places: Alberton, Sale, Hotham, Richmond, Lucknow, Bairnsdale, Geelong and back to Richmond. While living at Richmond between 1893 and 1896 they lived in at least three houses. They next appear in Tenterfield in northern New South Wales in 1903. Why the move? I have no idea. They also lived in Killarney in Queensland in 1908. When William and his wife die in 1919 and 1921 they are living in Newcastle. William may have moved chasing work as a labourer from one state to the next. Children were left along the way - the older ones stayed in Melbourne, my great grandmother was married in Killarney and lived in Tenterfield. Others later lived in Newcastle. This continual movement certainly asks many questions most of which will remain unanswered and makes for more interesting research as one tries to unravel the mysteries of my family history. 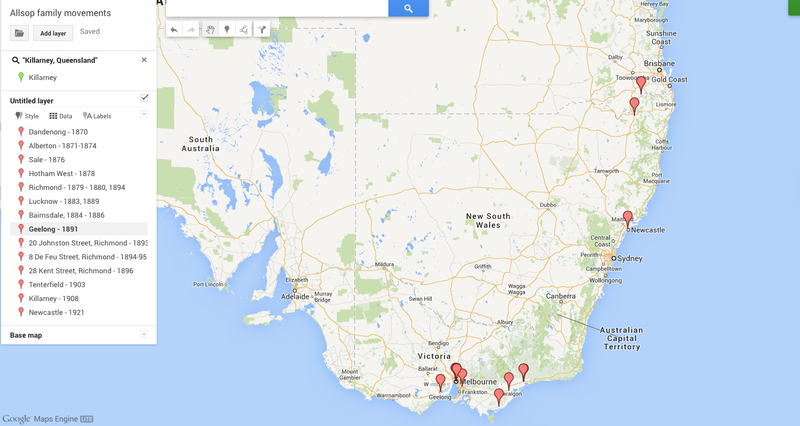 Screenshot of Google map showing known locations of the Allsop family 1870 - 1921. Zoom in for a better view.